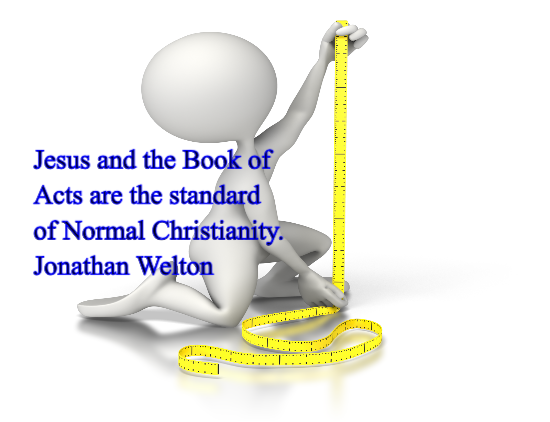 What is normal Christianity? Dr. Jonathan Welton explores this topic in this excellent book. Jesus and the apostles lived normal Christian lives. Dr. Welton points out that what we call revival is actually simply a return to the way things are suppose to be all the time! Read the quotes below, but be sure to pick up this challenging book and explore the world of Normal Christianity. Jesus and the Book of Acts are the standard of Normal Christianity. Jesus Christ is the example of Normal for the Christian. To be different from Jesus in any way is to be an aberration from the standard set by His life. Maintaining your own spirit and the fire of the Holy Spirit within you is how you sustain revival. Seeing God as relational and responsive is a major key to living as a Normal Christian. God sent you through the valley so that you would take over the valley, not so that you would submit to the valley experience and live in depression for ten years. It is not the job of churches to spiritually feed the believer; it is a personal responsibility to feed oneself. Before we can attempt to love God, we must make our first priority to receive love from Him. The reality is that we cannot even love God correctly until we are receiving His love. The result is that every time we sin, we do not treat ourselves with the same unconditional love that God has for us. We beat ourselves up and become disappointed and angry at our failures. This is a sign that our love for ourselves is completely passed upon our performance and is thus conditional. Value and worth are always determined by what someone else is willing to pay for something In our case, God was willing to pay for us with the death of Jesus. Therefore, we are of equal value to Jesus in the eyes of the Father or else He made a bad investment. Whenever you see the fruit of control, you can tell that fear is at the root. Freedom and independence are not the same. Freedom comes through self-control, whereas independence requires the control of the surrounding environment. Freedom comes because individuals are in control of their own lives and choices; self-control enables a person to stay walking in love regardless of the circumstances. Independence is maintained by keeping others at a distance so they do not gain control over us. People who walk in independence do not walk in love. The only way to walk in love is to walk in freedom. We are called to live above reproach [sin], but not above suspicion. If we are going to be like Him, we cannot live with so much concern for the opinions of others. Viewing all females to whom they are not married as either their sister or mother will encourage appropriate interaction between the genders. Normal Christianity measures spiritual maturity by love, not by theological knowledge. Spiritual fathers have been entrusted by God to train sons and daughters how to walk safely in freedom. Love that motivates freedom is the difference between controlling leaders and empowering leaders. When we embrace Jesus, we are embracing Truth, because Truth is a Person. If the freedom that you are walking in leads you into sin, rather than away from it, you are getting your freedom for a source other than Jesus and the Holy Spirit. But if we teach people that their number one priority is to receive the love of God and walk in love toward others, then they will safety handle the freedom they are given. That is exactly what legalism does, it creates burdens that God never intended. Focusing on the heart would result in less rebellion in the Church and in Christian homes. The truth is that we are not His slaves, but we choose to be His bondservants. According to the Old Testament Law, a bondservant was given freedom and then made a choice to give his life to his master. For a Normal Christian, most spiritual warfare is not about getting out of sin, but maintaining freedom from sin or legalism. When God sent Jesus to pay the wages of your sin, He was not trying to buy a slave. God wanted free people who would choose to become His bondservants out of love for Him. God is not a slaver owner. In the eyes of God, repentance literally rewrites your life story. God does not separate Himself from us, but when we access our past, we choose to turn away from Him. Because God does not exist in our repented-of past, we literally have to leave God behind when we delve into our past. The repented-of past actually does not exist; therefore, to go back there is to live in a false reality. It would have put God to shame if, after He has forgiven them, they choose to go back and rehearse the past over and over. That is a total disregard for God’s forgiveness and shows no desire to move forward with Him. The truth is that God made one choice to forgive all sin forever. Therefore, He never has to choose to forgive again. Change is brought about not from condemnation and guilt, but from a loving and forgiving Father. The conscience is a spiritual organ within us that the Holy Spirit speaks to when He convicts us of sin. Many people often claim that they have forgiven, yet if there is still pain in the memory, then there is still more forgiveness needed. Pain is an excellent guidepost; keep praying until all the pain has been removed. Much is missed by modern Christians when we do not look closely at the power of the meaning of names in the Bible. As an ambassador, you stand in delegated authority…Presently, Jesus is stilling at the right hand of the Father, waiting while His ambassadors (the Church) put His enemies under His feet. The curse only changed the way that men and women would interact, not the way that God would interact with women. The reality is that the Bible strongly speaks of freedom and equality between the genders. As delegated authorities, by crushing satan under our feet, we are placing satan under Jesus’ feet. Normal Christians are aligned with King Jesus and busy co-laboring in the takeover of this planet. From this we can conclude that the Christian worldview should be a realistic, optimistic worldview. Raising the dead is not a fringe doctrine, but a basic belief in Normal Christianity. We cannot spend precious time on the defensive against the onslaught of evil in the secular entertainment world. If there is a counterfeit, there is an authentic that we need to find and reclaim. The test of authenticity is always about origin. It is dangerous to operate in spiritual realms without being in right relationship with the Lord of Heaven and earth. We must go into the sheepfold through the gate, which is Jesus Christ. …the strongest resistance does not come from the sinner, but from the fellow saint. When you become Normal, you upset the status quo, and you force the Average Christian to begin a painful self-evaluation. When we catch the thief [satan], he will come face-to-face with the fact that he has launched the Church into double spirituality and power that we had before he robbed us. Retribution day is coming.